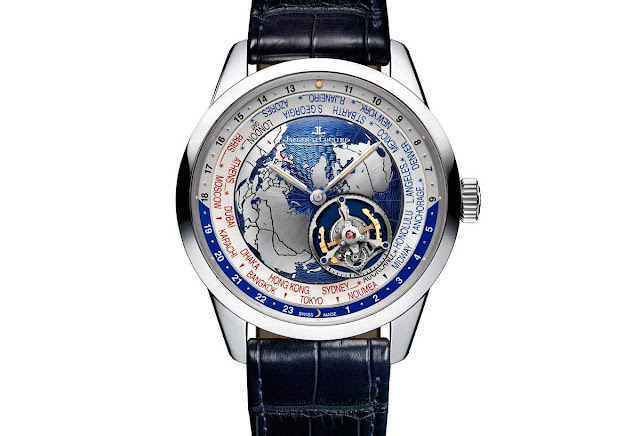 After the Geophysic True Second and the Geophysic Universal Time, Jaeger-LeCoultre expands the line with the Geophysic Tourbillon Universal Time, the first flying-tourbillon worldtimer produced by the brand. 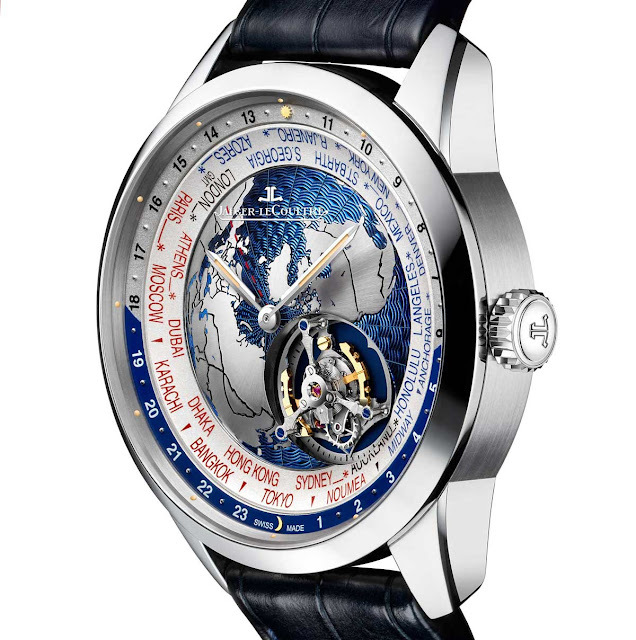 The look reminds the Universal Time model but the large flying tourbillon positioned 4 o’clock makes a big difference. 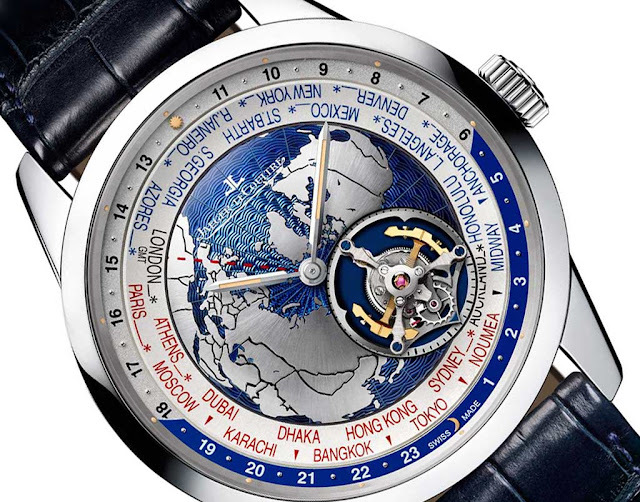 Compared to the standard world timer model, here the rotating 24-hour ring was moved to the exterior of the city disc which is fixed in order to allow the wearer to easily find the time zone of interest. Local time can be adjusted operating on the crown and independently of the minutes and seconds so avoiding any loss of precision. Once the universal time has been set, there is no need to adjust it while travelling. The central part of the dial features a slightly domed world map with a guilloché decoration to represent the sea. Completed by baton-type hands treated with Super-LumiNova, the eye-catching dial is framed by a 43.5 mm case crafted from platinum. 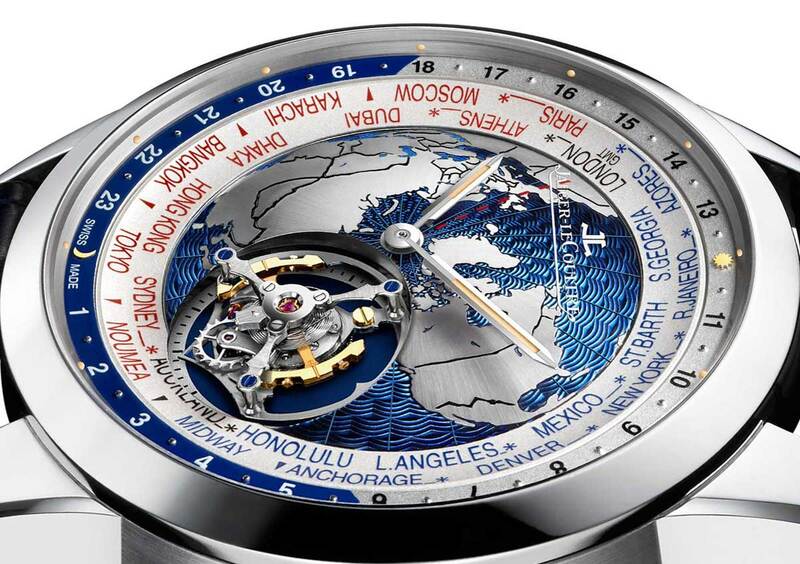 The Geophysic Tourbillon Universal Time shares with the other models of the collection the atypical balance wheel featuring a non-circular configuration designed to help to reduce air friction. Named the Gyrolab, this device was initially developed in a laboratory version back in 2007 to equip the Master Compressor Extreme Lab 1 watch. 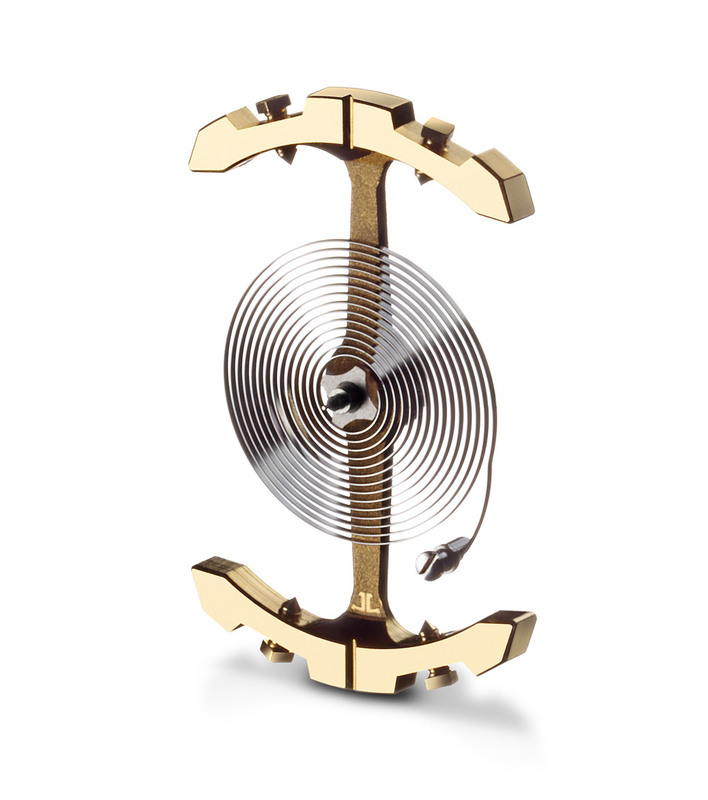 After the Extreme Lab 1 and the Reverso Gyrotourbillon 2 introduced last year, the Geophysic Tourbillon Universal Time is the third Jaeger-LeCoultre model with a tourbillon featuring the Gyrolab balance. 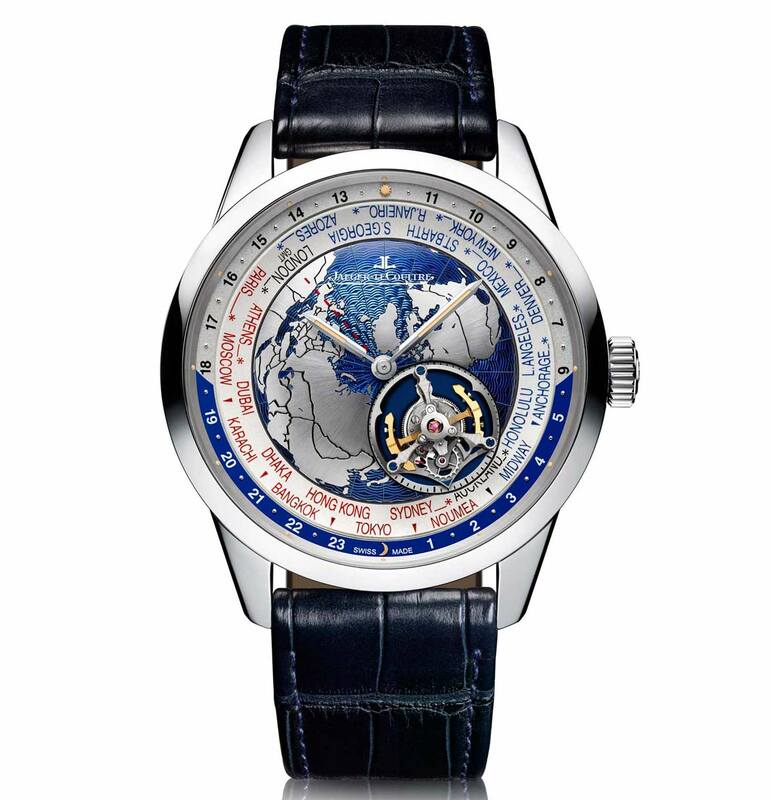 The Jaeger-LeCoultre Geophysic Tourbillon Universal Time is a limited edition of just 100 pieces with a retail price of around Euro 145,000 / US 145,000. 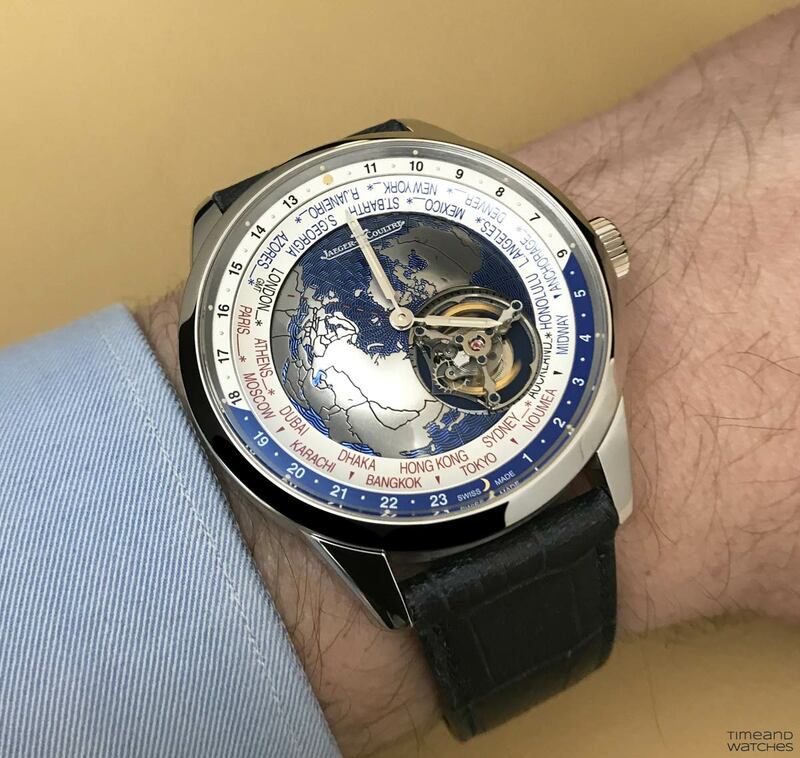 Pre-SIHH 2017: Jaeger-LeCoultre - Geophysic Tourbillon Universal Time. After the Geophysic True Second and the Geophysic Universal Time, Jaeger-LeCoultre expands the line with the Geophysic Tourbillon Universal Time, the first flying-tourbillon worldtimer produced by the brand. The Jaeger-LeCoultre Geophysic Tourbillon Universal Time is a limited edition of just 100 pieces with a retail price of around Euro 145,000 / US 145,000. More on this model and its movement will be unveiled on occasion of the upcoming Salon International de la Haute Horlogerie (Geneva, January 16-20).